Here it is, the second part of Wishlist: Marvel vs. Capcom 3 Costume DLC. Like the first part, these posts contain our choices of what we think / hope will make it into the game as downloadable content. 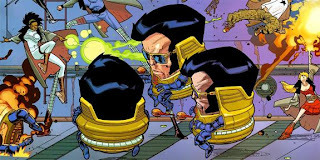 In this installment we will be exploring costume ideas for Team Pimp Chair (M.O.D.O.K, Dormmamu, Dr. Doom) as well as the three Capcom characters with more questionable motives (C. Viper, Tron Bonne, Wesker). You can check the guesstimations after the jump. 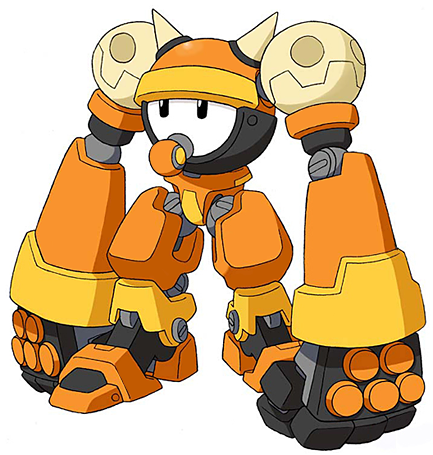 Tron Bonne, in theory, could be an interesting character to work with in terms of DLC costumes. Not only can you give Tron herself a new look, but also the Gustaff battle robot she uses to fight. For Tron, a lot of her video game appearances have her sporting her pink outfit. However, in Mega Man Legends 2, she also had something a bit more formal. 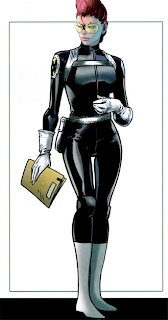 Trading in her short sleeve jacket and pants for a blazer and skirt, she gives off that flight attendant vibe without the need to show her rear (Cammy U Must B Jokin'). As for her Gustaff battle robot, it could be redesigned to reflect the youngest sibling in the Bonne family, Bon. Sure, it may seem a bit morbid but it could totally work. Make his legs shorter, head a bit bigger, then throw our anti-hero in there and viola. You have a Tron alternate costume that could never be accomplished through palette swaps. 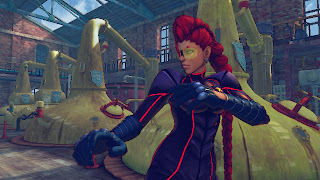 Crimson Viper is one of the newest characters to be representing the Capcom side, thus she doesn't quite have the history and source material to be pulling costume inspiration from. Luckily, Viper has received a few different downloadable costumes in her native game, Street Fighter IV. All three of these outfits could work, but Battle Suit Viper seems more at home in the MvC Universe. Speaking about the MvC Universe, while it may have been for joking purposes, MvC3's credits sequence showed us that Capcom character can pull off some of Marvel's more iconic attires. With that being said, it would be neat if some of the DLC found Marvel and Capcom characters dressing up as each other. What better way to spark this initiative than to live out C. Viper's ending and give her her own S.H.I.E.L.D uniform. Whether it be her cosplaying as Nick Fury, Maria Hill or even Black Widow, this would certainly bring a new meaning of cross-over to the game. Before Wesker was bent on total global saturation, he was also a member of of the S.T.A.R.S. unit. Seeing as Chris' downloadable attire was taken from their collective past, it would be a safe bet that Wesker's threads will follow suit. As cool as the trench coat is, it seems that bulletproof vests over short sleeved shirts get the job done. At least he still has his sunglasses. While Team S.T.A.R.S. Resident Evil seems inevitable, Wesker has also been found wearing suits in past Resident Evil games. 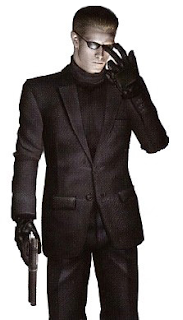 Seen in Resident Evil 4's Mercenaries mode as well as in Umbrella Chronicles, Albert can be found sporting a black turtle neck under a blazer. It's a nice look, and would definitely bring some class to Marvel vs. Capcom. I'll be honest, I'm a really big fan of the in game palette swaps that were chosen for M.O.D.O.K. 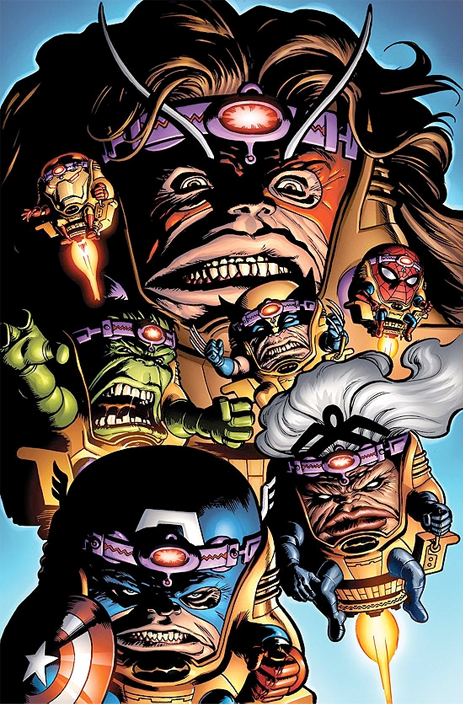 Alongside the Troll-tastic M.O.D.A.M look, his colour scheme from the cover of "Super-Villain Team-Up - Modok's 11" was incorporated as well. Since the DLC costumes are going past the colour swaps, there have been a few stylized looks of his that can certainly make it into the game. If the designers over at Capcom are taking inspiration from old comic book covers, then why not utilize "Marvel Adventures: The Avengers #9". Here we have a few of the Avengers ensemble M.O.D.O.Kified. 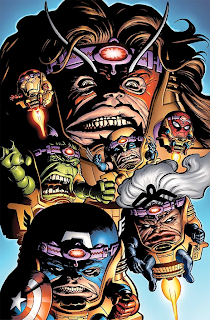 Maybe it would be asking too much (hey, we know licensing is some serious business), but you can't deny how surreal it would be to have one of the Marvel cast square off against their M.O.D.O.K counterpart. On a more realistic tone, there are other looks that seem more plausible but are equally as wacky. When talking about potential M.O.D.O.K alternate costumes online, there is one image that tends to pop up. No other costume could properly capture the insanity that is the Versus games than Elvis M.O.D.O.K. Once again, while it may be too silly to be true, it can certainly work in the world this world that Capcom has crafted. However, on a fully realistic note, there's one look that shouldn't be a surprise if chosen. If Spider-Man's Big Time palette swap is any indication, then we know Marvel input is heavily influenced by upcoming events in their comics. It just so happens that M.O.D.O.K is making his return to the panel real soon. With that return also comes a new look. 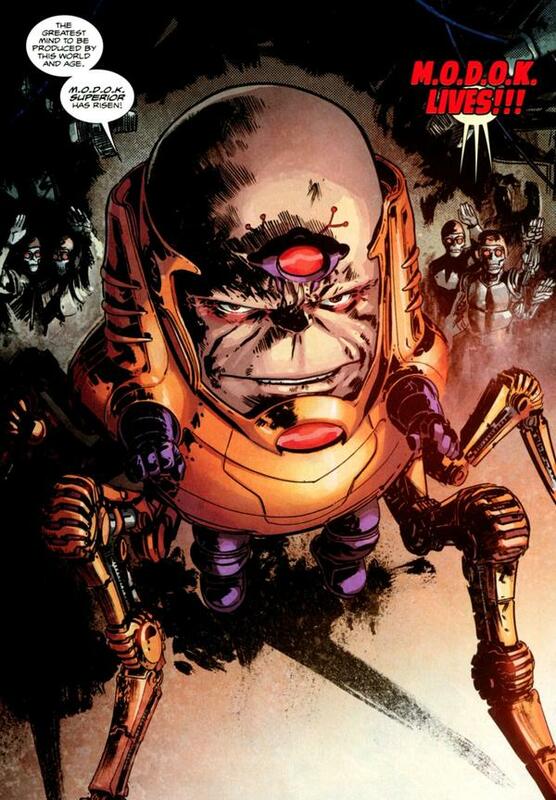 As boring as it may sound, there's a chance that M.O.D.O.K's alt will more or less be him missing some hair. Are we all in agreement that Dormammu looks pretty badass in Marvel vs. Capcom 3? It certainly is an outfit that screams serious diabolical business. Unfortunately for him, Dormmy didn't always have that menacing appearance. Throughout the decades that he has spent tormenting Dr. Strange and the rest of Marvel comics, he had a very different look. If Thor is any indication that original appearances are fair game, as well a lack of other looks to choose from, then you may be downloading original Dormmamu in the near future. I'm sure those boots and shoulder pads will give off the same presence. Really. 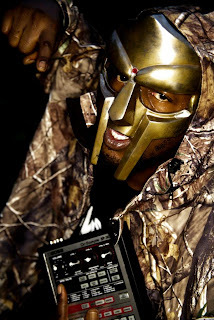 In a perfect world, I would be able to download an MF DOOM Dr. Doom alternate costume. What better way to honor a man who based his original rap image/persona after one of your characters than to make him a DLC costume for that character? If various Yipes quotes can make it in game, so can rap's own masked villain. 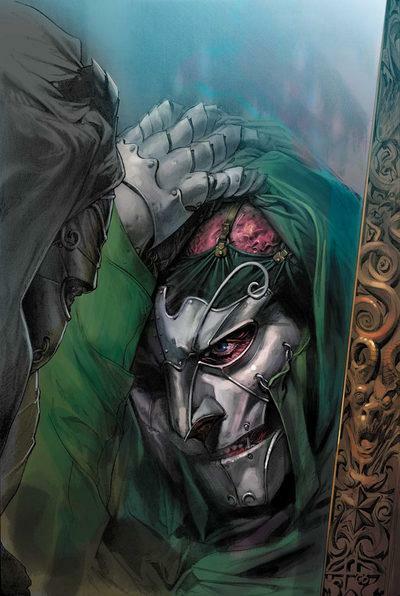 Hopeless daydreaming aside, Dr. Doom has had a few different looks over the years, but they all revolve around his trademark metal mask and green cloak. Victor Von Doom has such a prominent look where once you've seen one, you've practically seen them all. That's not to say there aren't a few stand out attires. 1602 is one of Marvel's most unique universes, and it would be nice to get some representation within the hectic world of Capcom Versus. 1602 Dr. Doom looks a bit more refined, sporting a classy looking mask that would serve as quite the contrast to his current in-game look. 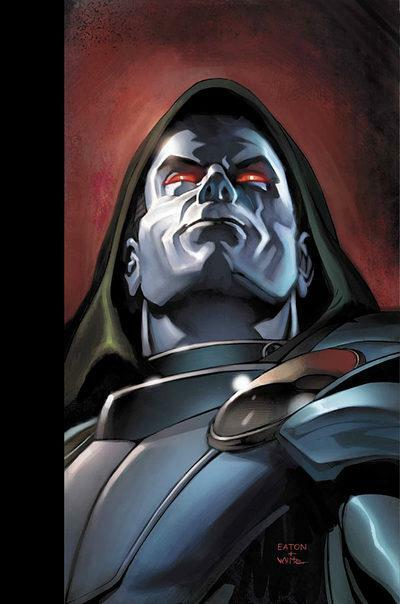 Then there's the Dr. Doom from the House of M Story Arc. 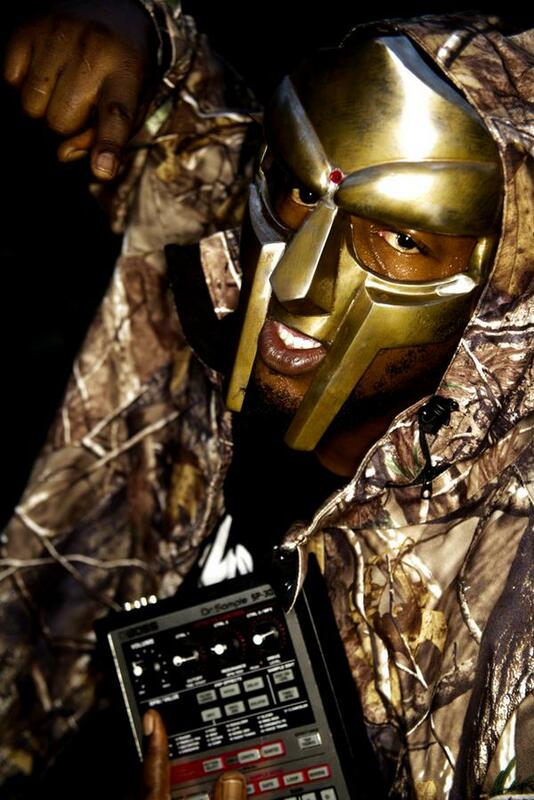 Ditching the metal mask for liquid metal skin, it would be a nice alternative as a pseudo-maskless Doom. Besides, there are other characters on roster that could pull off the whole hideously scarred face thing better than Victor.